Gandharba in Nepal are considered Dalit's ie 'untouchables' and are one of Nepal’s most disadvantaged castes. Until the 1970's, they were not allowed to go to school for fear that their 'unclean' children would touch high caste children. The Sarangi team are part of the first generation of Gandharbas to receive a higher education. They consider it their duty and responsibility to right the wrongs of the past and uplift their community. Kedar is a qualified music therapist. He is committed to creating social enterprises and is a shareholder and managing director of ’Sarangi Food.Music.Life’ and the ‘Sarangi Social Enterprises’. Before joining The Music Therapy Trust in 2009, he worked in the community development sector for 5 years and in the education sector for 3 years. His main role was technical reviewer in a joint venture between the Ministry of Education, Government of Nepal and the Danish International Development Agency. He has extensive experience in building relationships with INGOs, local NGOs and stakeholders. Kedar became Nepal’s first Clinical Music Therapist in 2009, when he graduated at The Music Therapy Academy (TMTA) in New Delhi, India. He has 9+ years experience working for Autism Care Nepal Society as well as in Education – Mainstream and Special Schools – for Charities and Social Services. He also manages private clients. From first diagnosis up to senior adulthood, Kedar has worked with the most isolated non-verbal people as well as some bright and articulate individuals. He composes music, plays the Sarangi, Nepali Drum and sings in various bands. Yogendra received the Australia Award in 2012 and pursued his higher education in Australia where he earned his masters degree through Murdoch University. Yogendra specialised in the field of Community Development, and has a 10 years of working experience in development sector in the areas of project management, social and community mobilization, partnership management, coordination and collaboration, and report writing. He has substantial working experience in education, disaster response, health and right-based sectors. Currently, he is working with Plan International Nepal as a Community Mobilization Specialist and contributing technically, to implement National Early Grade Reading Program (NEGRP) which is led by the Ministry of Education, Science and Technology. He also worked as a volunteer in Gandharva Samaj Nepal (Nepal), Kathmandu and supported to develop proposal, report writing, and other project management tasks. He has a passion for taking a lead in community development through community engagement and community-based planning. He is committed to uplifting his community and is a huge asset to Sarangi Social Enterprises. Amrit is a Clinical Music Therapist. He is a founding member of the ‘Sarangi Food.Music.Life’ and the ‘Sarangi Social Enterprises’ and is committed to empowering the Dalit communities that he works with. He also volunteers at the restaurant by playing music in the evenings, occasionally assisting the wait staff and shopping. Amrit was born in Gorkha and moved to Kathmandu when he was 18 so that he could attend University. Apart from spending short periods of time abroad for work and study, he continues to live in Kathmandu. From 2009-2010 he worked in Dubai and from 2011-2013 he studied clinical music therapy in India. On completing his post graduate diploma in 2013, he returned to Nepal and has been working as a clinical music therapist ever since. Amrit provides music therapy to a variety of Nepali NGO’s including Autism Care Nepal, Navojoti Centre, Disabled New Life Centre and SOS Village. Amrit also volunteers his time and skills with ‘Gandharba Society Nepal’, ‘Gandharba Cultural Art Organisation’ and ‘Gandharba Health Projects’, Adelaide. Through various projects, these organizations promote and conserve Gandharba culture as well as create positive change within the community. Amrit loves his work as a music therapist. He also feels privileged to represent his community in such a broad variety of roles and is proud to a member of the Sarangi projects. He looks forward to what the future offers. Pujan is a founding member of ‘Sarangi Food.Music.Life’ and ‘Sarangi Social Enterprises’ and is committed to uplifting all marginalised castes, particularly the Gandharba community though his political activities. Pujan strongly believes in the social enterprise model as a vehicle to uplifting Dalit communities. He volunteers at the restaurant by playing music in the evenings and assisting whenever there is a need. Pujan comes from Bhanu municipality ward no 1, Bhansar Tanahun. He has lived in Kathmandu since 2008 when he comenced his higher education, which included computer studies and playing music. His interest in politics started in childhood when he was confronted by social issues which led him to public speaking and becoming a youth leader in his community. By the time he reached college, he became active in student politics and began raising his voice for general student rights. It is during this time that he also became aware of the power of politics as a key element of change and in the development of community and nation. Pujan graduated from Tribhuvan University in 2015, with a major in Sociology. His main aim is to preserve, promote and safeguard Gandharba and Nepali traditional music and at the same time, uplift communities though education and awareness. Through his political activities, he is working to provide equal opportunities for Gandharbas. He is also involved in several education, health and livelihood projects as well as student empowerment activites. • Nepal Dalit Student Union - as a Central Committee member 2012-2014 and Secretary since 2014. • Street to Stage - as a musician. • Sarangi Food.Music.Life - as one of founding members and shareholders. • Sarangi Social Enterprise - as one of founding members and shareholders. Pujan spends most of his time participating in political activities, volunteering at Sarangi Veg and playing music. He is really happy to be a part of the all the projects and organizations he works with and hopes to continue creating something new, important and needed for Nepali society. Sudesh is one of the founding members of Sarangi Social Enterprise. He was born in Khairahani in Chitwan and came to Kathmandu in 2014 when he finished his high school education. At that time, he planned to go to the Middle East for work. This seemed like a risky decision, so Sarangi offered him a job as one of its first waiters. The restaurant was about to open and it was a very exciting time, so Sudesh was happy to accept the job, as well as contribute to his community. Sarangi was more than happy to sponsor his waiter training and English lessons, and thus began his career in hospitality. In 2015 Gandharba Health Projects sponsored his training as a bartender and now Sudesh is one of Sarangi Veg's most popular and committed staff members. Suresh is a great ambassador for his community as he brings the joy of Gandharba culture to the guests through his talented dancing, singing and playing of traditional musical instruments. Jyoti is founding member of GSN (Gandharba Society Nepal) and is one of the shareholders of Sarangi Social Enterprises. She is from Gorkha district and is currently studying her Masters in Sociology at Padmakanya Campus. Joyti works in the field of women's development and rights awareness. She is committed to uplifting her community though education and regularly meets with women groups, conducting field based training in group management and leadership development. Joyti also supports women groups in developing micro-saving programs for the purpose of creating income generating activities, which are so important in the empowerment process. She conducts literacy training as well as organizing field observation tours for women groups. • Centre for Community Development and Research – as a community mobilizer for market access for smallholder farmers – Dairy MASF, Project Gorkha. • Daraudi Riverbank Poverty Alleviation Project from July 2009 to May 2011 as a social mobilizer. • Samata Foundation. She has an interest in community development, women's empowerment, human rights and livelihood programs. Joyti is involved in her community and always gives her support and expertise generously when needed. Sabitri is one of Sarangi Social Enterprises shareholders. 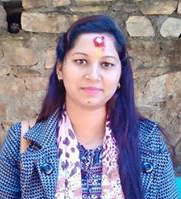 She was born in Bhanu Municipality in Tanahun district and after completing her school level education, she moved to Gorkha where she attended Dullav Campus and completed her intermediate studies and higher education. After leaving college, Sabitri worked in local microfinance and also received training in sewing and knitting. When Sabitri returned to her village she encouraged the children of the village to go to school. She also helped motivate the women in the village to keep learning and create some kind of sustainable work in their homes so that they could improve their lives. In 2016, Sabitri married and moved to Kathmandu where she received leadership training, sewing / knitting training and incubation training about social business from NSB (Nepal Social Business). Sabitri has come a long way, and is now running her own dressmaking shop in Shyambhu. She is very interested in working with women's groups, the community and also with children. Sabitri is always available when her community needs her support and expertise.